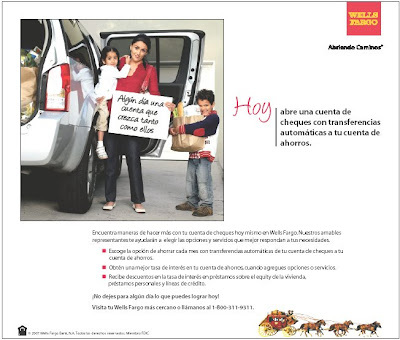 Not long ago US banks targeted Hispanic savers with half-hearted bilingual brochures and poorly-managed Spanish-language call centres. More recently they have courted this fast-growing demographic with integrated and more culturally-sensitive marketing campaigns. How have they changed and why? It's easy to see why banks are chasing the Hispanic dollar. Some 41 million or 14 percent of the US population are Hispanic. By 2020, that percentage is expected to reach 18 per cent. According to Harris Bank, one of the US providers chasing the Latino market, there were already six US states with a critical mass of Hispanics in 2004: Arizona, Illinois, Texas, California, Metro New York and Florida. In total, US-based Hispanics (also referred to as Latinos) wield an annual estimated spending power of $600 billion. Only half of US Hispanics bank. Some 40 per cent have credit cards and a mere third have mortgages, according to Mintel Research. US Hispanics have historically been sceptical of banks. They often have first hand experience of banking volatility from Latin American economies and faced barriers to use US banking services. Rather than putting savings in a US domestic bank, many continue a tradition of remitting cash back to home countries. According to the Pew Hispanic Center, a non-profit US research body, US remittances to central and Latin America accounted for an estimated US$18bn outflow of cash from the US in 2005. According to Harris, bank industry moves towards online and telephone banking may also not suit Hispanics who prefer using face to face counter service. The complex nature of Hispanics - a term which encompasses US-based people with roots in Mexico, Cuba and Puerto Rico as well as other Latin American countries - has lead marketers in recent years to discuss them using theories of acculturation. Acculturation is the belief the immigrant and indigenous cultures can interact and be changed by this contact whilst both remaining distinct. It has been used to distinguish between long-standing and newly-arrived US-based Hispanics, and between those with different degrees of bilingualism - factor strongly correlated with their income levels and financial requirements. For instance, in 2006 Pew estimated that foreign-born Hispanic heads of households who had been in the US since 1990 or earlier were almost four times more likely to own their homes than those arriving after 2000 (60.4 per cent versus 16.7 per cent). According to the same source, native-born US Hispanics also had a median income which was almost 14 per cent higher than their foreign born Hispanic US peers, and they were 50 per cent more likely to be in the group of workers earning at least $50,000 a year.